Will you help to deliver and lead UK university sailing? 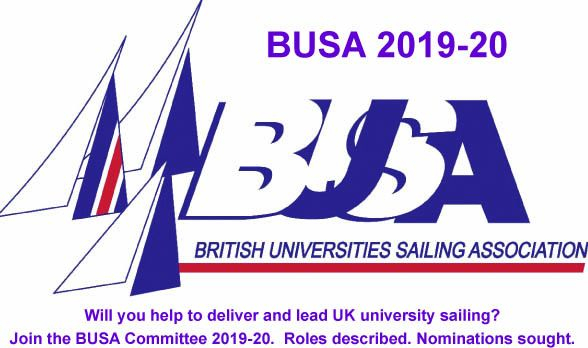 The new BUSA Committee for 2019-20 will be elected at the Annual General Meeting to be held during the Yachting Championships at Portsmouth on Tuesday, 16 April. At that meeting the current Committee will be presenting proposals for the future structure and organisation of BUSA. These have already been consulted upon with Commodores of the University Sailing Clubs in membership of BUSA. It has been agreed to seek nominations for the Roles as identified in these proposals. The Roles are described in the attached Role Descriptions. Nominations are now sought. If you would like to help deliver and lead UK university sailing, please complete and submit an Application on-line. Nominations close at 23.59 on the 1st April 2019. Once you have submitted your application you will be contacted by BUSA (busa@rya.org.uk) with confirmation. Attendance at the AGM is recommended, but not a requirement for election.